Jamie Bissonnette, Jason Bond, and Irene Li are cooking with the whole animal or plant, and think you should, too. “It doesn’t really matter what the vegetable looked like originally after you’ve peeled it and cooked it and sliced it,” says Mei Mei co-owner Irene Li. At Mei Mei, Irene Li won’t use a visually unappealing collard green on a plate, but she’ll happily chop it for the restaurant’s signature pesto sauce. INSIDE THE KITCHEN OF COPPA, chef Jamie Bissonnette’s trendy South End enoteca, sous-chefs pause during food prep to pull out cellphones or scraps of paper and jot down notes about the dishes they are making. Later, they record these scribblings on a sheet hanging on the wall, accounting for what they did with every part of the whole pig or fish they just cut up — taking everything from nose to tail and turning it into menu items. It might sound like ingredient minutiae, but Bissonnette occupies rare air among chefs, as a James Beard Award winner (think the Oscars of food) and a Chopped champion, where his expansive approach to ingredients probably helped him win the improvisational cook-off. He’ll serve fish ribs grilled and batter-fried tempura style, and braise the head and tail in an effervescent Basque wine to make a bright fish stew. Pasta dishes may come with a topping of cured and dehydrated roe sac, grated. His chimichurri and salsa verde likely include carrot tops along with the usual herbs and spices. James Beard Award-winning chef Jamie Bissonnette carefully tracks how food is used in his restaurants, including random weighings of the food trash. MOST AMERICANS HAVE nothing like Bissonnette’s zeal. On average, Americans throw away 20 pounds of food per month. That insults the hungry — in Massachusetts alone, nearly 1 in 11 people doesn’t have enough to eat — and hurts the planet, because while rotting food emits methane, we must also consider the energy needed to produce, transport, market, store, and dispose of unused food. If unused food were a country, it would produce more greenhouse gases than any nation except the United States and China, according to a 2011 report by the Food and Agriculture Organization of the United Nations. Culinary celebrities like Bissonnette can serve as catalysts for getting Foodie Nation to change its ways. “They really are in a position to be fantastic role models and sources of inspiration for all of us,” says JoAnne Berkenkamp, senior advocate in the Food & Agriculture Program at the Natural Resources Defense Council. Underlying their noble work is the cold hard truth that restaurants struggle to make money. Irene Li, who co-owns Boston’s Mei Mei with her siblings, says that “if we buy a chicken that was raised in Massachusetts on pasture and we pay $3 to $4 per pound for it, you can bet we’re using every bit of skin and cooking the bones for stock.” We might like the idea of local, organic foods, but they cost more to produce. Li credits stints working on farms for teaching her how we underuse many kinds of vegetables. 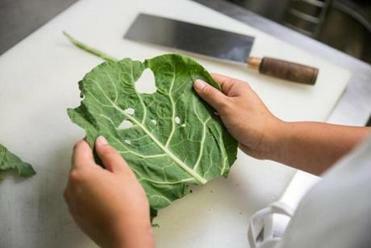 Beet greens are part of the same family as Swiss chard and cook up like it, she says, and broccoli leaves are just as edible as their botanical cousins, collard greens. Jason Bond of Bondir still spends time on the farm in his quest to pursue “root-to-leaf” cooking. He’ll harvest his own vegetables at Sweet Autumn Farm in Carlisle and from a mini garden on his deck at home. He’ll even pull from a couple of micro plots in his neighborhood in Cambridge, where he plants seeds he has saved for unique flavors (foods like rat-tail radishes, anise hyssop, and sour gherkins). His goal is easy access to ingredients he probably will not find in a produce company’s catalog or at a farmers market. They might have muskmelons, for example, but by harvesting himself, he has learned that the fruit is not the only tasty part of these plants. “The flowers can be cooked gently until they are crisp and make a really pretty garnish,” says Bond, and the tendrils (early leaves) can be treated like a garlic scape or green bean and sauteed. Even under-ripe fruits can be used. “They make a really good pickle,” Bond explains. 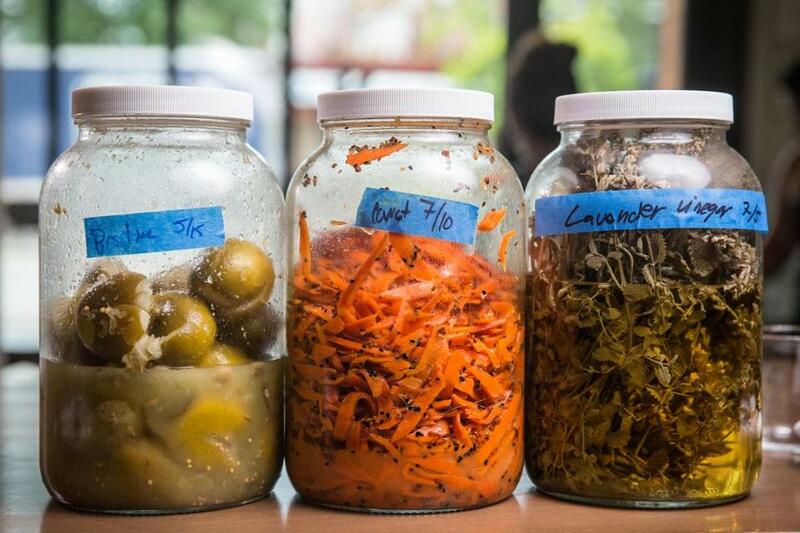 Indian pickled lime, carrot shavings, and lavender vinegar will be used for new dishes at Little Donkey in Cambridge. Pickling, drying, and repurposing surplus produce extends his investment. “You get so much more out of each product,” he says. 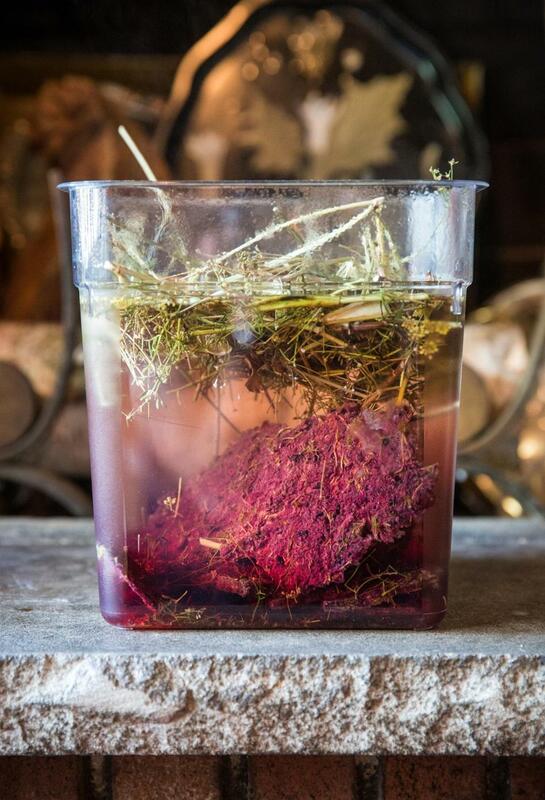 A peek into the storage drawers and shelves in the Cambridge restaurant’s kitchen reveals bins of pickled rhubarb floating in a garnet-red syrup, which he will whip into a rhubarb marshmallow dessert or a bracing vinegar-spiked drink called a shrub. A pale yellow candied citrus zest — scraps from a large grapefruit-like fruit called oroblanco — will be chopped up and turned into a marmalade. Bond likes to harvest bronze fennel and dry its flowers, which can be turned into a fine fennel pollen. He’ll dry and sift the fresh green seeds to yield an aniseed-like spice and use the stalks as an aromatic device to skewer bass or add a Provencal flavor profile to lamb. The flower and seeds can also be ground into powder and mixed with salt to serve as a flavorful meat cure. Using the whole plant is frugal, yes, but also spurs creativity, he says. With a well-stocked pantry like his, “when you want to write a dish, you can go to your pantry for whatever flavor element you are looking for, and it’s automatic creativity,” he says. Similarly, Bond says, “you can get so many more experiences out of a chicken than just a chicken breast.” Not only will Bond make confit out of the legs and thighs and simmer the bones to create chicken stock, but by reducing the stock, he can also create a “really savory jus.” Chicken feet, he says, can be preserved in a chili vinegar solution, pickled, slow-cooked, chopped, and turned into a “chicken feet vinaigrette” to be served over bitter greens like chicory. 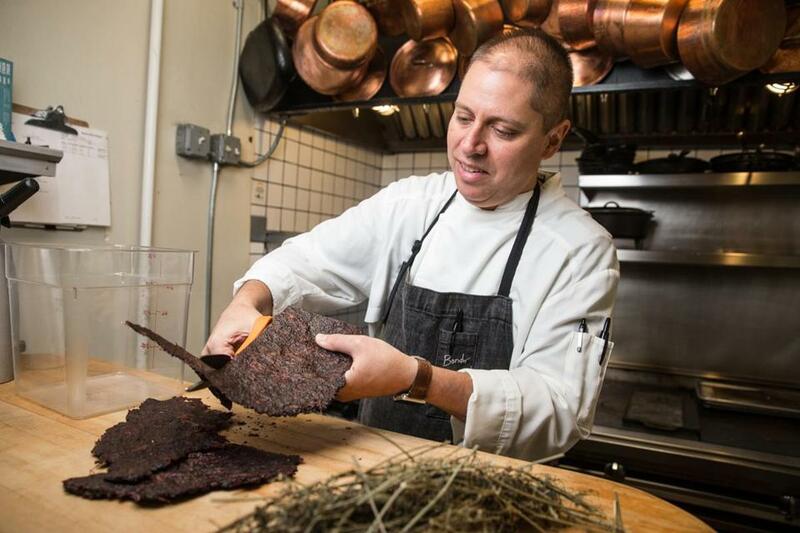 Bondir chef Jason Bond cuts up the dehydrated black currant scraps and fennel stalks in his Cambridge restaurant. FOOD WASTE IS A MASSIVE social concern in Massachusetts, which in 2014 became the first state to implement a ban limiting the amount of organic waste food that businesses can send to landfills. Massachusetts businesses and consumers in total toss out between 800,000 and 900,000 tons of food each year (restaurants account for about 18 percent of food waste nationwide). The state’s ban applies only to larger food-service businesses, ones that produce more than a ton of food waste per week. But many smaller restaurants work voluntarily with the state to divert their food waste. Some progress has already been made. In 2016, two years after the ban was put in place, the state diverted 270,000 tons of food products from the waste stream, up from 100,000 in 2008, according to John Fischer, branch chief for commercial waste reduction at the Massachusetts Department of Environmental Protection. Some of that food waste was composted, some went to one of the state’s six anaerobic digestion facilities to be converted to bioenergy used by farms, and some went to farms as animal feed. We’re still discarding enough food each year to fill Fenway twice over, so there is room to improve. But we were early to a national trend. Last year the United States Department of Agriculture and the Environmental Protection Agency set a goal of slashing food waste in half by 2030, to address climate change and fight hunger. Chefs at upscale restaurants might not seem like obvious candidates to help the 600,000 to 700,000 Massachusetts residents classified as food-insecure (meaning they don’t know where their next meal will come from). But Ashley Stanley, executive director of Lovin’ Spoonfuls, a Boston-based food rescue organization, says food insecurity “is a problem we can solve by utilizing food better.” Waste-conscious chefs can show the rest of us how. Thirty chefs work with Lovin’ Spoonfuls to help reduce hunger. Some of them, including Bissonnette and Li, share their thrifty food-saving tips with low-income residents through Lovin’ Spoonful’s educational outreach program. 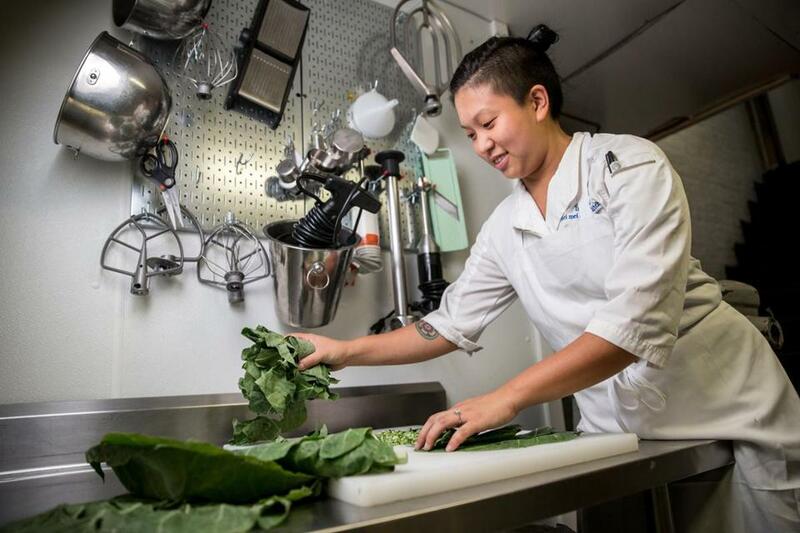 Others help by participating in events like August 15’s Ultimate Food Rescue Challenge, where teams of chefs transform surprise “food waste” ingredients into delicious fare. Proceeds went to Three Squares New England, which supports hunger relief agencies throughout the Boston area. At Bondir, leftover black currant seeds and skin are dehydrated, then steeped along with bronze fennel stalks to produce a mead served with sourdough. BOTH RESTAURANT OWNERS AND CHEFS can be catalysts for change, says Chris Cochran, executive director of ReFED, a coalition of businesses, nonprofits, and policy makers across the United States dedicated to solving the food waste problem. A ReFED report looking at how to cut 20 percent of our food waste within a decade noted that restaurants could curb waste by tracking food loss and reducing plate and portion size. Chefs who implement waste measures and then make a point of telling their patrons about those solutions “can help drive cultural and consumer change,” Cochran says. He didn’t always think this way. 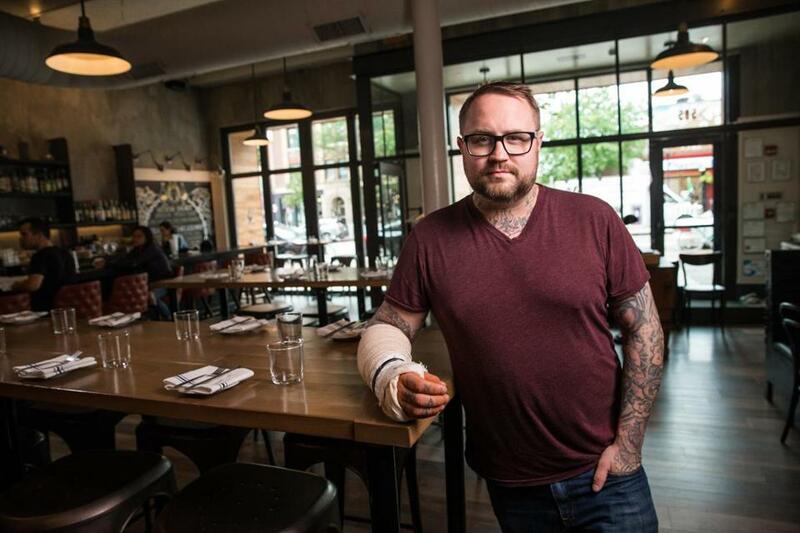 His epiphany on food waste came about 12 years ago, when he was doing a brief stint cooking with Kimpton chefs on the West Coast to prepare for the executive chef position at KO Prime, the now-defunct steakhouses formerly in the boutique hotel chain Nine Zero. 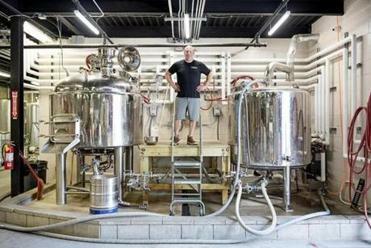 “I remember cooking in Seattle and being blown away by how every restaurant had large cans for recycling and composting — and tiny garbage cans for trash,” he says. Lori Miller Kase is a freelance journalist in Simsbury, Connecticut who frequently writes on health and nutrition. Send comments to magazine@globe.com.